This is a minimal example of hot module replacement (or HMR) in a Redux application. The working demo code is hosted on GitHub. 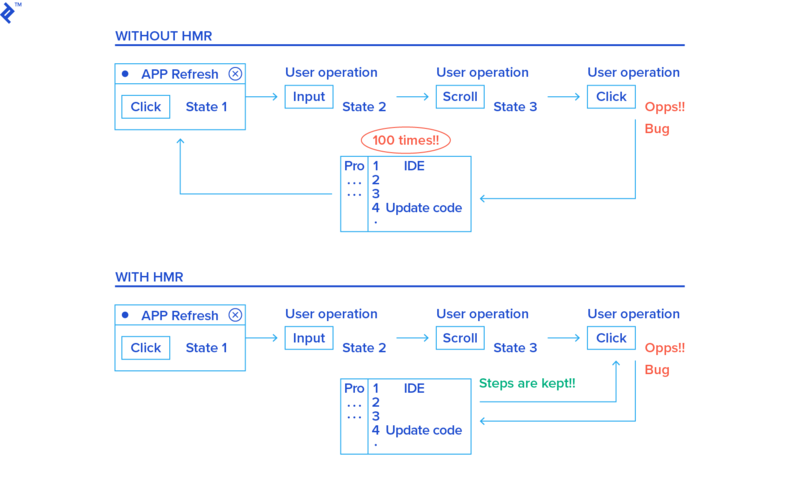 We only include those settings essential to support HMR, making you easy to apply HMR in your own Redux application. If you cannot wait to apply HMR, jump to this section to set up HMR for your project within five minutes! Get your hands dirty first! Before you run the commands to start this example application, please ensure that Git, Node.js, and Yarn are installed correctly on your machine. Then visit http://localhost:3000/ to see if it works. Upon writing your code, hot module replacement is able to update the page without a full refresh. More importantly, the Redux state is kept while other resources have been updated in place. 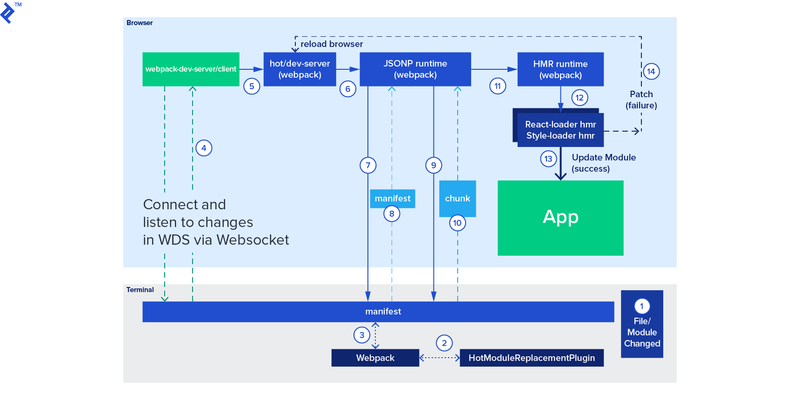 Hot module replacement is one of the most useful features offered by Webpack. It allows all kinds of modules, including JSON, CSS, and JS files, to be updated at runtime without needing a full refresh. The application asks the HMR runtime to check for updates. The runtime asynchronously downloads the updates and notifies the application. The application then asks the runtime to apply the updates. The runtime synchronously applies the updates. Modify the code that potentially causes the bug. Refresh the page, add the particular item to the store. If the bugs persist, repeat Step 1. The above iteration will be repeated again and again if the bug is difficult to find. In the real world, the bug may only appear after even more operations. HMR helps us to compile and apply the modified code while keeping the current store value unchanged. We do not need to repeat Step 2. It boosts the efficiency of development. Note: In some cases, the code modification may affect the current store value. In that case, HMR will warn you to reload the entire page. We want to keep the feature minimal, just to demonstrate the HMR capability. So in this application, we do not incorporate common features in a React application, including redux-logger, react-router-redux, redux-thunk, redux-devtools, etc. Meanwhile, we keep only one reducer, two actions, and 1 page. Our application keeps only a counter value in the store. We have only one page called home, which displays the counter value and two buttons to increase/decrease the counter value. The page is not refreshed. The displayed counter value is NOT CHANGED. The title has been changed to Counter in store. To set up HMR, follow these steps. We need to configure HMR in the Webpack configuration file webpack.config.js. The HMR plugin generates a Manifest, a JSON file listing the updated modules, and an Update, a JSON file containing the data to be applied. What to be noted is, HMR is an option provided by Webpack. Loaders like style-loader, which implement the HMR interface, receive an update through HMR and then replace the old code with the new code. For more advanced settings of HMR, please refer to the HMR API. HMR may fail silently without any warnings. When you update the code and save, the page simply does not update at all. This is probably because your system does not allow you to watch so many file changes. On Ubuntu, you can run sysctl -a | grep inotify to view the current user.max_inotify_watches value. Try to increase this number by running: sudo sysctl fs.inotify.max_user_watches=524288. Alternatively, append a new line fs.inotify.max_user_watches=524288 to file sudo vim /etc/sysctl.conf and then run sudo sysctl -p /etc/sysctl.conf to apply the change. What is the Redux framework? Hot loading or hot swapping is the action of updating the application code while the application is running without reinitializing the application. Previous articlejava – What is the better way to fetch the location path from pc? Next articleAsk a UXpert: What is the Most UX-Friendly Summer Vacation You’ve Ever Been On?